A highly significant object—in terms of English history, art and propaganda—has re-emerged in London, having mysteriously vanished from the royal collection in the early 19th century. 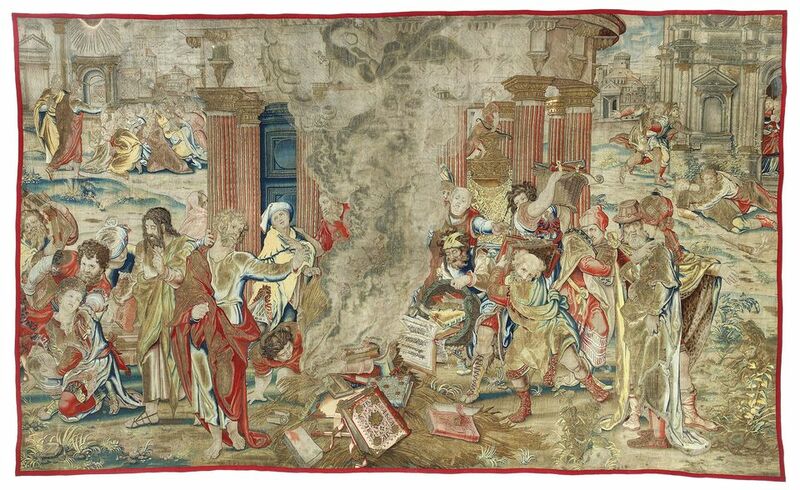 The Burning of the Heathen Books, a 20ft-long tapestry shot through with gold, was commissioned by Henry VIII for Hampton Court Palace in 1536. Last month, it travelled to the UK from Spain temporarily for conservation by the S. Franses Gallery, leading textile specialists. We understand that an attempt may be made to save the tapestry for the nation. The last time the tapestry was seen in London—its provenance unrecognised—was at the Vigo-Sternberg Galleries around 1970. It was bought by a Barcelona-based dealer between then and 1974, and taken to Spain. Some experts believe that the tapestry left the UK without an export licence and was not registered when it arrived in Barcelona. Even before its association with Henry VIII was rediscovered, The Burning of the Heathen Books was recognised as an exceptional work of art. In the early 1970s, it had a market value of around £8,000, then the price of a modest house in the English capital. In terms of its age, quality and price alone, an export licence would have been required before it could could leave the country. Yet there is no mention of it in the published reports of the Reviewing Committee on the Export of Works of Art, which go back to 1954. Furthermore, had there been an export application the piece would have been shown to an expert for evaluation. Wendy Hefford, a tapestry specialist at the Victoria & Albert Museum in London (V&A), the custodian of the National Collection, says that she never saw it. The work has changed hands twice since arriving in Barcelona. In 1989, it was bought by a Madrid dealer and collector who in 2012 sold it to a client abroad (not in the UK). A Spanish export licence was then applied for and refused, in part because there was virtually no documentation of its history. In preparation for a second attempt, the dealer asked S. Franses to undertake provenance research. The tapestry was granted a temporary Spanish export licence for conservation that expires in February. Thomas Campbell, the former director of New York’s Metropolitan Museum of Art and the foremost authority on the vast tapestry collection of Henry VIII, saw photographs in 2014 of the Burning of the Heathen Books and quickly recognised it as one of nine panels in a Saint Paul set woven in Brussels to designs by Pieter Coecke van Aalst, ordered by the Tudor king, which had long been thought lost or destroyed. Henry VIII ordered the work during the Dissolution of the Monasteries when he, too, ordered the burning of books. He hung it at Hampton Court, its gold and silvery threads shimmering in the candlelight: a beguiling, cunning assertion that, like the apostle, his acts were those of a profoundly religious man. In 2016, S. Franses and its present owner, who is open to selling the work, agreed that the tapestry would go to the gallery in Jermyn Street, London for cleaning. But the tapestry’s return could be blocked. In terms of its importance to Spain, a surviving set of the Saint Paul series woven to designs by Coecke van Aalst—from the collection of Margaret of Austria, Spanish Queen Consort—is already part of the National Patrimony collection in Madrid. It holds hundreds of other high-quality 16th-century tapestries, most of which are not on view. In contrast, Britain has around 30. One obvious future home is Hampton Court, where it hung more than 500 years ago. The V&A would make an appropriate home for it, too. During the panel’s recent three-week public display at S. Franses, it was viewed by many specialists—including leading representatives from the London museum.